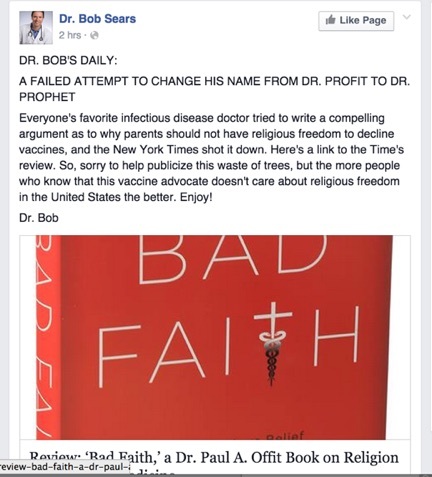 On March 13, 2015 Dr. Bob Sears, a California antivaccine physician, wrote a post on Facebook attacking Dr. Paul Offit, pediatrician, vaccine inventor, scientist, vaccine advocate and educator. Everyone’s favorite infectious disease doctor tried to write a compelling argument as to why parents should not have religious freedom to decline vaccines, and the New York Times shot it down. Here’s a link to the Time’s review. So, sorry to help publicize this waste of trees, but the more people who know that this vaccine advocate doesn’t care about religious freedom in the United States the better. Enjoy! When dealing with those pushing pseudoscience, like the antivaccination cult, the most frustrating thing is that they tend to ignore and deny the most basic tenets of science. If denying the fact of gravity would further their goals of “proving” vaccines are neither effective nor safe, they would do so. And now that it’s flu season, they’re producing zombie tropes about flu vaccine ingredients. If the antivaccination movement didn’t lead to epidemics of long-gone diseases, which can harm and kill children, the conversation would be over. I would just put the vaccine deniers in the same group as evolution deniers (creationists) or gravity deniers (there has to be some, somewhere). I would mock their pseudoscience, and move on. Of course, their denialism does lead to deaths of children, so we have to do what is right, and stop their lies, misinformation and ignorance in every forum we can. We have to appeal to scientific values, and despite the fact that antivaccination pushers don’t share those values, we must continue to try. I have gotten enough emails and comments from people that they have started to vaccinate because of what I have written, so maybe some child’s life is better because all of us who support vaccines are heard. 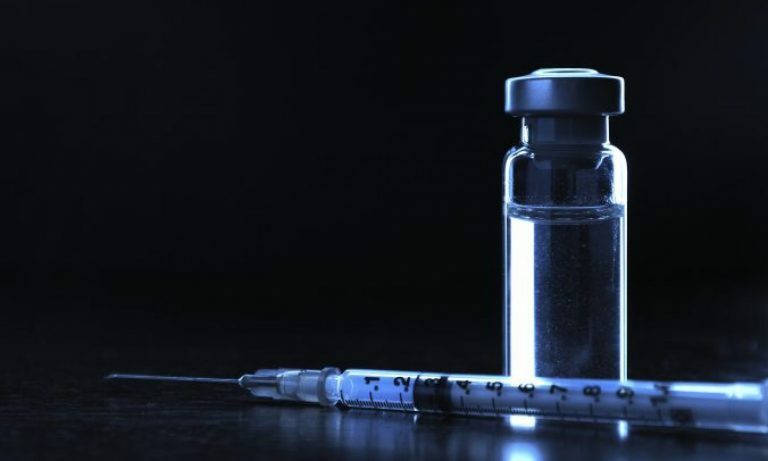 This article reviews a recent ruling from an Italian Court of Appeals that overturns a widely ridiculed decision by a Provincial Court in 2012 that claimed that the MMR vaccine (for measles, mumps and rubella) causes autism. Apparently, that court rejected all other science, and only accepted the fraudulent work of Mr. Andy Wakefield to validate the claims about the vaccine and autism. The Italian MMR autism decision has started to return as a zombie trope. Probably as a result of the kerfuffle about the anti-vaccine propaganda movie, Vaxxed. In June 2012, a provincial court in Rimini, Italy granted compensation to the family of a child named Valentino Bocca. The family alleged that the MMR vaccine Valentino received as part of his childhood immunizations caused his autism, and the court compensated them on that theory. The lower court’s decision was never on very firm grounds: it depended in part on testimony of an expert witness who relied, in turn, on Andrew Wakefield’s debunked study. Unfortunately, this Italian MMR autism decision has been used by anti-vaccine activists as part of their claims that vaccines cause autism. Opponents of legislation to tighten school immunization requirements have been promoting a movie called Trace Amounts to legislators and others. They seem to think this movie proves a link between thimerosal – a mercury-based preservative in vaccines – and autism. It shows, in their view, that our vaccine program is corrupt and harmful through and through, and hence is an argument against vaccine mandates. The movie, however, shows nothing of the sort. There is no new evidence in it, and it simply repeats old and disproven claims. Samia and Marc Larère, parents to a three year old and fifteen months old, have decided not to vaccinate them. A criminal charge was brought against them, by the government of France, for not giving their three year old the required vaccines against diphtheria, tetanus and polio according to the French vaccination program. They were charged under two legal provisions–a provision in the Code of Public Health (le code de la santé publique, art. L.3116-4) that imposes a find of 3750 euros and up to six months in jail for those who do not receive, or allow those under their guardianship to receive, mandatory vaccinations, including parents (“Le refus de se soumettre ou de soumettre ceux sur lesquels on exerce l’autorité parentale ou dont on assure la tutelle aux obligations de vaccination prévues aux articles L. 3111-2, L. 3111-3 et L. 3112-1 ou la volonté d’en entraver l’exécution sont punis de six mois d’emprisonnement et de 3 750 Euros d’amende”). And a provision in the criminal code that criminalizes neglect of parental duties “to the point of risking the health… of a minor child”, with a fine of 30,000 euros and up to two years in prisons as penalty (article 227-17: “Le fait, par le père ou la mère, de se soustraire, sans motif légitime, à ses obligations légales au point de compromettre la santé, la sécurité, la moralité ou l’éducation de son enfant mineur est puni de deux ans d’emprisonnement et de 30 000 euros d’amende”). The reason the Larères initially gave for declining to vaccinate their child was that they could not give her only the required vaccines–the only available vaccines, they said, had the required vaccines in combination with others, like Hepatitis B and meningococcal, which are not legally required and they were not willing to give the combination vaccine to their child. Upon further probing, however, the couple admitted they received a vaccine containing only the required vaccines from Sanofi Pasteur, but still refused to vaccinate claiming that the vaccine contained a “toxic product”. Editor’s note: This article was originally published in January 2015. It has been revised to include information from a recent Australian Federal Court ruling that imposed fines upon the homeopaths. On December 22, 2014 an Australian Federal Court ruled that Homeopathy Plus! Pty Ltd, LTD, and its creator and director, Ms. Frances Sheffield, engaged in misleading conduct in trade or commerce in making claims against the whooping cough vaccine and in support of homeopathic remedies as an alternative – or a second line of defense – for preventing whooping cough. This was done after the Australian Competition and Consumer Commission (ACCC) asked the court to declare that it’s misleading and impose other penalties (detailed description of the court proceedings, and more information). In other words, they were asked to look into homeopathy honesty. Provide a brief overview and summary of the decision. Determine whether similar action can be taken against those making similar claims in the United States. As I mentioned previously, I got the flu vaccine a few days ago. As of today, I do not have a fever, febrile seizures, Epstein-Barr, a reptilian tail growing out of my back, sudden desire to eat durians, or abrupt inclination to watch English Premier League soccer. But I know I am protected against the flu, and that’s a good thing. I haven’t had the flu since the 1980s, not because I am a superior human being with the most powerful immune system in the world. It’s because I make sure I’m vaccinated against the disease every single year. Part of the reason I got the flu jab was because my employers demanded it. They needed me healthy when I passed out bribes to physicians and surgeons–oops, I mean when I was visiting top physicians and surgeons to plan clinical trials. Of course, my employers demanded I wear lead aprons when training physicians on imaging and diagnostic procedures in cardiac cath labs, so maybe they actually cared about me. So what is this miracle immune boosting flu protection – is it being suppressed by the CDC, FDA, WHO and the Illuminati? And why does Big Pharma hate it – is it keeping them from printing money? And of course, there are no immune boosting flu protection miracles. Well, except for the one actual miracle – the seasonal flu vaccine, and that’s not a miracle, it’s outstanding science that created it. It is very safe, unless you ascribe to myths about flu vaccines. It is usually very effective, although the vaccine is based on reasonable and scientific estimates of what mutations will be prevalent during the flu season, and sometimes, they’re off. Your immune system is very powerful, and, except for instances of chronic diseases or malnutrition, it is always very powerful. You cannot boost your immune system through junk science – one of the few ways to “boost” your immune system against flu is the flu vaccine. And why does Big Pharma hate the flu vaccine? Because if more people got sick from the flu, they’d make an economic windfall from all of the stuff they’d sell to hospitals. And Big Mortuary would be just as happy. Even though flu vaccine uptake is not as high as we want, it’s still keeping the gold bars away from Big Pharma and Big Mortuary. On October 5, 2015 the Supreme Court of the United States denied cert in Phillips v. New York, a group of three cases that considered issues surrounding vaccines and religious exemptions. This post shortly explains the case and what denying cert means (and does not mean). On September 23, 2015, Lauren Stephens filed a “Parental Rights and Responsibilities” initiative with the California Attorney General. This initiative provides a chance to reflect on the tension between parental rights, the rights of a child and the role of the state.